Rebuilding Together Sacramento, in partnership with the City of Rancho Cordova, will be rebuilding and beautifying approximately 15 needy homes in the Aspen Creek, Cordova Lane and Walnut Wood neighborhoods of Rancho Cordova. Rebuild Days are life-changing for the homeowners and rewarding for volunteers and we ask that you join us in volunteering to make this all possible.Both skilled and unskilled volunteers are welcome. Unskilled volunteers - help with painting, yard clean-up, etc. Skilled volunteers - Contractors, plumbers electricians, carpenters, roofers, fence builders, painters, landscapers, etc. 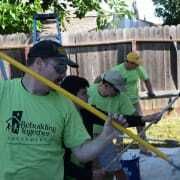 Rebuilding Together Sacramento’s mission is to bring volunteers and communities together to improve the homes and lives of low-income homeowners in need. Our vision is a safe, efficient and healthy home for all people. Our cost effective method of rehabilitating housing stock results in a three-to-one return on every dollar invested. We could not make this happen without the generous support of sponsors and volunteers.